It was already a rather dangerous situation for the Catholic party in Germany. The Protestants were able to continue claiming power over more and more dioceses, using the same technique each time: the proportion of Protestants within the cathedral chapter responsible for the bishop’s election became increased until they were powerful enough to elect a Protestant bishop. This bishop obviously then only appointed Protestants as canons, forcing the Catholics onto the defensive. In 1600, ecclesiastical Northern Germany was firmly in Protestant hands. Bremen, Lübeck, Riga, Halberstadt and Magdeburg, Brandenburg and Naumburg-Zeitz – in total, the Catholics had already lost 18 German dioceses. For the Catholic noble classes, in particular, this was a bitter loss, as rich bishoprics were used to sustain younger sons. They didn’t have to be priests, and only rarely did a candidate for the episcopal dignity go all out and become an ordained priest. Ernst of Wittelsbach chose this route when he announced his candidacy for the Archdiocese of Cologne. Cologne was, after all, of great importance, since the Archbishop of Cologne was one of the seven electors who elected the king of the Holy Roman Empire. The fact that the cathedral chapter still chose his opponent showed a certain degree of hostility. 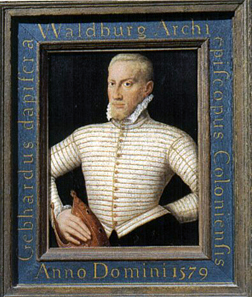 Gebhard Truchseß of Waldburg, Responsible for the Strasbourg Chapter Conflict. What nobody knew at the time was that Gebhard Truchsess of Waldburg, the newly elected Archbishop of Cologne, was preparing to convert to Protestantism, an act that went against the (not uncontroversial) ‘ecclesiastical reservation’ that had been incorporated into the Augsburg Settlement. The change in religion would mean a loss of position and dignity. The emperor and pope both realized the risk posed by a loss of the crucial Cologne diocese. They pooled their forces and resources to first fund Ernst of Wittelsbach’s election as bishop and then to fund an army, which not only exiled Gebhard of Waldburg from Cologne, but also drove out his Protestant supporters in the cathedral chapter. Gebhard of Waldburg wasn’t just the Bishop of Cologne, he also acted as cathedral dean, as provost of the cathedral chapter of Strasbourg. Given this status, it’s little wonder that he was easily able to provide his assistant in Cologne with a position in Strasbourg’s diocesan chapter. Because of this, those who had been driven out of Cologne had a place where they could go. 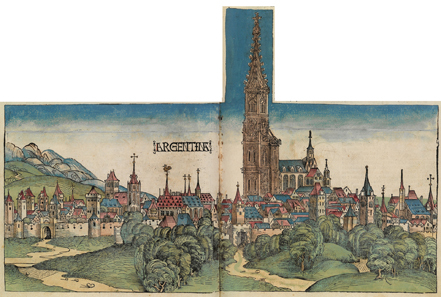 A View of the City of Strasbourg from 1493. The city of Strasbourg was a very good place for Protestants. The citizens were staunchly Lutheran-minded and the city was a member of the Schmalkaldic League. The growth in Protestantism was welcomed by the city, as it immediately employed armed force to drive the Catholic portion of the cathedral chapter out of the city – at the time, Bishop Johann IV and his Catholic cathedral chapters were based in Saverne, the Protestant cathedral chapter in Strasbourg. Johann Georg of Brandenburg. 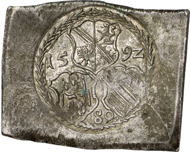 Uniface Thaler Klippe of 80 Kreutzers, 1593. EuL 448. From Gorny & Mosch Auction 183 (2009), 5211. The conflict intensified greatly in 1592 when the old bishop died and both parties elected a successor. The Protestant successor was 15-year-old Johann Georg of Brandenburg, and for the Catholic successor, Karl of Lorraine. Armed conflicts quickly followed. At the beginning of 1592, the Catholic army surrounded Strasbourg and besieged the city. This is also the time that our little series of siege klippes was created. Johann Georg of Brandenburg. Uniface Half-Thaler Klippe of 40 Kreutzers. EuL 449. From Gorny & Mosch Auction 183 (2009), 5208. As with most siege coins, these are very simply manufactured. The stamping is uniface only and depicts three coats of arms: on top, that of Bishop Johann Georg of Brandenburg, below it left, the shield of the cathedral chapter, and right, the shield of the city of Strasbourg. On the top, the cipher of year is inscribed, and below, the value numeral. 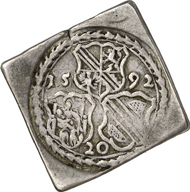 There are three weight variations: the pieces of a thaler of 80 kreutzers, the half-thaler pieces of 40 kreutzers and the extremely rare klippe of a quarter-thaler, or 20 kreutzers. The Swiss Protestants had repeatedly assured their fellow Protestant brethren in Strasbourg that, if needed, they could be in Strasbourg within a day to help support them against the Catholics. The Hirsebreifahrt, or ‘millet porridge’ trip, undertaken for the first time in 1456 and then repeated in 1576, was intended to be a symbol of this Swiss alliance, proving that they were true to their word. Just as they were about to set out, the Swiss loaded a pot of porridge onto the boat. The Swiss were able to reach Strasbourg so swiftly that the gruel was apparently still hot enough to burn people’s lips as they ate it. Johann Georg of Brandenburg. Uniface Quarter-Thaler Klippe of 20 Kreutzers. EuL 450. From Gorny & Mosch Auction 183 (2009), 5209. Even if the Protestants could have staved off the attack on Strasbourg, they weren’t able to assert themselves militarily in the long-term. 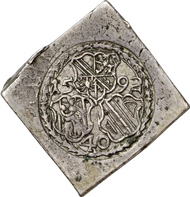 The Brandenburg Bishop recognized this in the Haguenau Treaty of 1604 and renounced Strasbourg for the one-time payment of 130,000 gulden and a yearly income of 9,000 gulden. Karl of Lorraine remained bishop. Leopold of Austria, the brother of the emperor, became coadjutor. This way, for the time being, the Catholics were able to retain control of the diocese of Strasbourg.